This winter weather has really slowed me down! My family moved from Florida to Michigan about 4 years ago to get back our true change of seasons, (the ones we grew up with anyhow =) ) I missed the snow, I always felt that the snow made me feel alive, it was a little more effort to do, just about anything, but I was happy to be back to the true, snowy winter, until this year! Any sickness that could be passed at school came home with one child or another this year. If the flu hit the school, one of my kids brought it home and passed it along, one by one, we all went down… I believe my house took on the whooping cough, the flu, strep, an ear infection, pneumonia you name it! This year was a little different in the fact that I, finally got hit with the flu myself, and the cough, and it just lasted for what seemed like forever! I haven’t had the flu in eons, what was worse was it all started just before Christmas.. (and guess who tackles all of the Christmas to dos in my house!) but it made me feel like the snow just had to go! (AND! that I really must give my children more responsibilities so that they can run this house when I’m down and out). I’ve decided I am officially turning my focus to spring… today =) Maybe if I wish it hard enough, it will come a little earlier than usual. 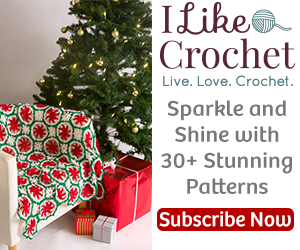 So, without further ado, I am announcing my Top Free Pattern Pick of the Week! This Spring Dahlia Dishcloth. Now, I have been running out of my cottons, so I have very little in the way of springy colors, I wasn’t thrilled with the colors on this that I went with, but I really like the pattern… And it kind of reminds me of the sun, which I’ve been missing =( . I’m constantly working sc, dc, hdc… This is working mainly treb crochet, and a couple other fun techniques, but it will work perfectly for either a dishcloth or a hot pad! (You might want to make double thickness for a hot pad on this. So pick your perfect springy colors and have fun! This project can be completed in under an hour, and again, it is totally FREE, courtesy of YarnSpirations!